Director of National Intelligence Dan Coats refuses to publicly discuss private conversations he's had with President Donald Trump. 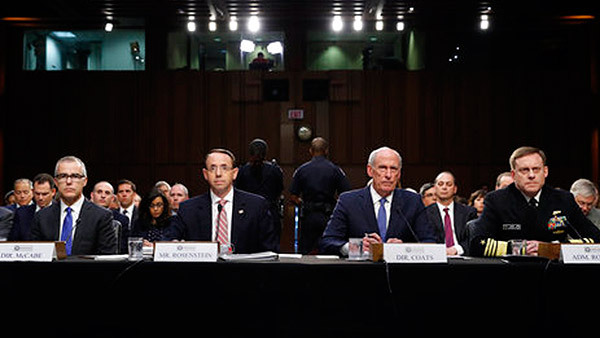 Coats was responding to a senator's question about whether Trump pressured him to publicly downplay the significance of the FBI's investigation into Russia's election meddling and possible coordination with the Trump campaign. Coats says he has never been pressured or felt pressure to intervene in shaping intelligence products. Coats was testifying Wednesday before the Senate intelligence committee. National Security Agency Director Mike Rogers says he's never been asked to do anything illegal or felt pressure to do anything immoral during his three years as head of the intelligence agency. Rogers was responding to a senator's question about whether President Donald Trump asked him to intervene in or downplay the ongoing FBI investigation into Russia's election meddling and possible ties with the Trump campaign. Rogers says he will not publicly discuss private conversations he had with the president. It's been reported that Trump asked Rogers to publicly state that there is no evidence that there was collusion between Moscow and the Trump campaign. Rogers was testifying before the Senate intelligence committee Wednesday about surveillance laws. The chairman of the Senate Intelligence committee is making a pitch for the reauthorization of a law governing the collection of foreign intelligence, saying it's critical to monitoring militants, potential terror threats and is subject to multiple layers of oversight. Sen. Richard Burr, R-N.C., says he understands that Americans' communications often are swept up in the process, but that now is not a time to roll back the Foreign Intelligence Surveillance Act, which expires at the end of the year. The panel's ranking Democrat, Sen. Mark Warner of Virginia, also lauded the law. But he used the hearing to raise concerns about reports that President Donald Trump asked top intelligence and law enforcement authorities to "publicly downplay" the investigation into Russian activities and contacts with the Trump campaign during last year's election.